A standard satellite dish antenna works by concentrating signals, that are picked up along its axis, to a single point. This point is called the focal point. The receiving amplifier is usually placed near the focal point and the concentrated signals are collected into the receiver using a small horn. This serves to further concentrate the signals to get the maximum possible signal level at the amplifier input. 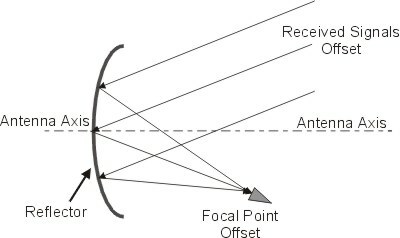 The focal point can be offset from the main axis so that the receiving equipment does not obstruct the beam in any way. This offset has the effect of raising the beam of the antenna. The exact amount that the beam is raised is equal to the amount of offset. Thus, if the offset is 20 degrees then the beam is raised by 20 degrees. Antenna shapes and sizes vary but they all do the same thing, every antenna dish you see including radio telescopes, which are basically receive only antennas, all perform this function. they all focus the signals they receive from a specific point oin space onto a small area where they can be received and amplified. The principle works in exactly the same way for transmitting a signal. The transmit amplifier produces a large signal to a horn set at the focal point. The signal is then radiated onto the dish (through the same horn used to pick up the receive signals) which in turn focuses the transmit signal into a parallel beam of energy out into space to the satellite. Thr transmit amplifier is also positioned as close to the focal point as possible to reduce losses. The horn used to transmit and receive the signals to and from the reflector is called a feed horn and is placed at the focal point also known as the feed point.